I'm not sure this pub is still a Youngs pub. There was only one real ale - Otter Amber on the one handpull. 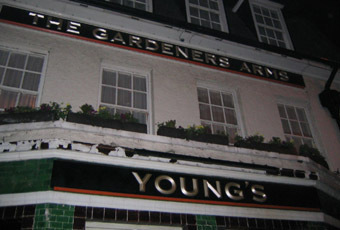 I doubt very much that Youngs would allow this. So it's probably a free house now. Although I would describe it as more of a gastropub. It was much busier than the Earl of Spencer nextdoor and despite the late hour, it seemed there were still many customers who had recently enjoyed a meal. The interior is laid out around a central bar, with a kitchen to one side. I'm not sure it's a good place to enjoy a beerintheevening, unless you're having a mealandbeerwithaspecialfriendintheevening. It certainly seems a place where couples were enjoying dates. Good pub (NOT little! ), nice atmosphere and reasonable prices. Beer well looked after. Will use when in the area. 7, pushing 8 /10. First time visitor at the weekend, wow - the food was amazing! Lovely little pub, just refurbed, friendly staff (turns out it's under new management) and really good grub. Highly recommend the pie - and the kids food went down a storm too. Pretty good - certainly better than before! Haven't tried the food yet but looks ok. A bit lacking atmosphere when I went in but it was a Monday. Will give it another go on a busier night. Following Stephen's suggestion (see below), I gave the Gardeners a second chance today and I'm happy to report that things were much improved. Had a lovely pint of Sambrook's Junction followed by a roast lamb dinner. The meal was piping hot with a generous portion of vegetables, gravy and mint sauce. The service was friendly and efficient yet unobtrusive. I can only think that last Sunday was a blip and I'll certainly be going back to the Gardeners.